Billy Joel: The Scoop on Long Island's Big Shot! Music legend Bill Joel is a native New Yorker. He was raised on Long Island in Hicksville and continues to reside on the Island in Oyster Bay. Joel’s first release hit song was in 1973 called “Piano Man.” The singer-songwriter has since sold more than 150 million records and is recognized as one of the most popular recording artists in the world. Some of Joel’s song hits include “New York State of Mind,” “You May Be Right,” “It’s Still Rock and Roll to Me,” “Allentown,” “Uptown Girl,” and many others. He has 33 Top 40 hits and 23 Grammy Award nominations. He’s also been presented the Grammy Legend Award in 1990; was inducted to the Songwriters Hall of Fame in 1992 and the Rock & Roll Hall of Fame in 1999; received the Recording Industry Association of America Diamond Award in 1999; presented with the Johnny Mercer Award in 2001; received a star on the Hollywood Walk of Fame in Los Angeles in 2004; was the recipient of the Library of Congress Gershwin Prize for Popular Song; and received the once-in-a-century ASCAP Centennial Award in 2014. Since December 2013, Joel joined Madison Square Garden to become the first-ever music franchise of “The World’s Most Famous Arena” performing a show a month. Shows have sold out one after another. And it was no different for the performance scheduled at Nassau Veterans Memorial Coliseum where he is the final performer before the venue closes for extensive renovation with an expected reopen date of December 2016. In this instance, tickets were sold out in less than five minutes – making it one of the quickest selling concerts at the Coliseum. involved in cleanup of Long Island. Joel has led an extraordinary life and career in the world of entertainment. There’s also the Broadway musical based on his music called “Movin’ Out” that has been nominated for 10 Tony Awards. He has taken home awards for Best Orchestration and Best Choreography. Joel has also been given honors like a Honorary Doctorate of Human Letters from Hofstra University and a Doctor of Music from Southampton College. Outside of music entertainment, Joel owns a bicycle shop – 20th Century Cycles – located right in Oyster Bay. The shop allows him to share with the motorcycling community his passion for motorcycles and motorcycle designs through his collection of bikes that have been modified. In July 2015 over Joel's annual July 4th party, he exchanged vows with Alexis Roderick. An intimate cermony was held at Joel's estate on Long Island with family and close friends, including long-time friend, Governor Andrew Cuomo and daughter with ex-wife Christie Brinkley, Alexa Ray Joel. The couple's first child together arrives during the summer. Billy Joel is the quintessential son to Long Island! Do You Have a Fun Billy Joel Story to Share? Let Us Know! Pictured: Billy Joel in concert; Billy Joel receiving the ASCAP Centennial Award in 2014; and Billy Joel at his bike shop on Long Island for the opening party. 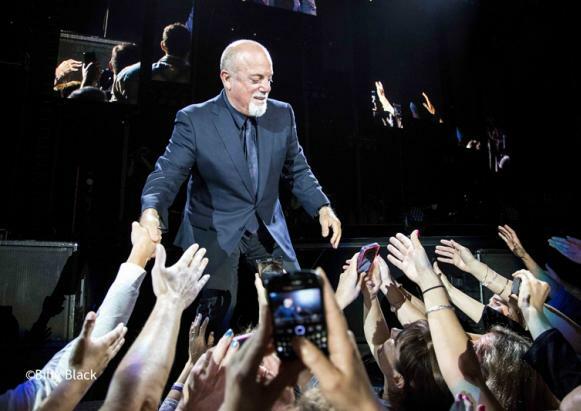 Photos via Billy Joel's official website.